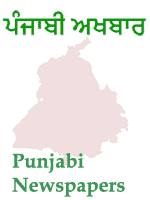 The following is a list of Punjabi newspapers and Punjabi news sites primarily published and distributed in Punjab, Haryana, Himachal Pradesh, Jammu, Delhi, and Rajasthan. One of the most widely read Punjabi newspapers covering business, politics, agriculture, health, sports, and more. Broadsheet-format newspaper published by the Tribune Trust. Punjabi-language daily newspaper based in Mohali. Leading daily English-language newspaper based in Chandigarh, India. The Tribune is one of the most influential newspapers in Punjab, Himachal Pradesh, Haryana, and the Union Territory of Chandigarh. The newspaper published by Jagran group circulated in Amritsar, Jalandhar, Bathinda, Chandigarh, Doaba, Gurdaspur, Kapurthala, and other areas in Punjab. Daily newspaper based in Ludhiana. The newspaper based in Jalandhar and featuring politics, business, sports, education, health, music, and more. Punjabi-language newspaper published from Jalandhar, Punjab. Punjabi-language newspaper published in Patiala, Punjab. Patiala's daily newspaper featuring latest political news, literature, Punjabi culture, movies, as well as national and international news. Weekly Punjabi newspaper, headquarters in California, United States. The newspaper primarily distributed among Punjabi NRI's.